A visitor to a modern cooperage will see massive, industrial assembly lines that would have made Mr. Ford and his Model T quite envious. Yet, no matter how quickly a barrel can be built, or how many hundreds of thousands can be churned out in a year, there’s no software program that can inspect a barrel for wear and tear, no machine that can be programmed to carefully break it down for repairs and then expertly piece it back together again. For that the hands of a true expert are needed, a Master Cooper, and there simply aren’t that many of them around any longer. 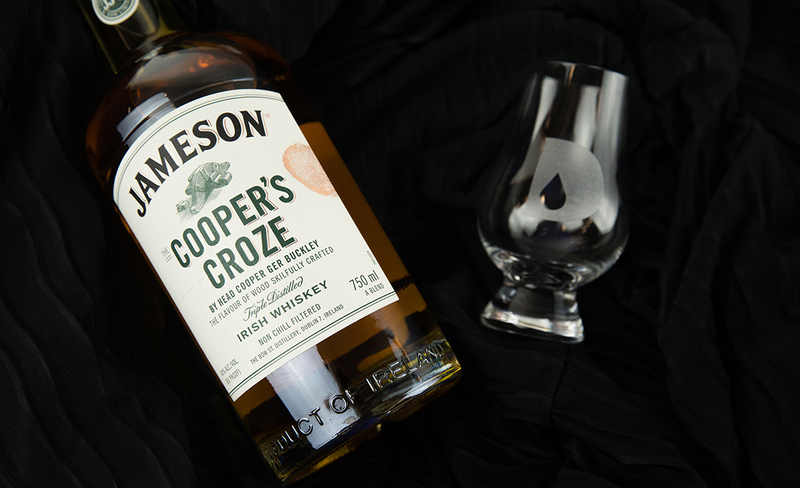 At the Midleton Distillery in County Cork, Ireland, home to the Jameson Experience and also the home base of the entire Irish Distillers lineup, including Redbreast, Midleton, Green Spot, Yellow Spot, Paddy, and Powers; a cooper can be found. Step into the cooperage workshop there and find Ger Buckley holding court, offering in-depth tutorials on all things wood, barrels, and coopering, all the while properly regaling guests with stories and jokes. 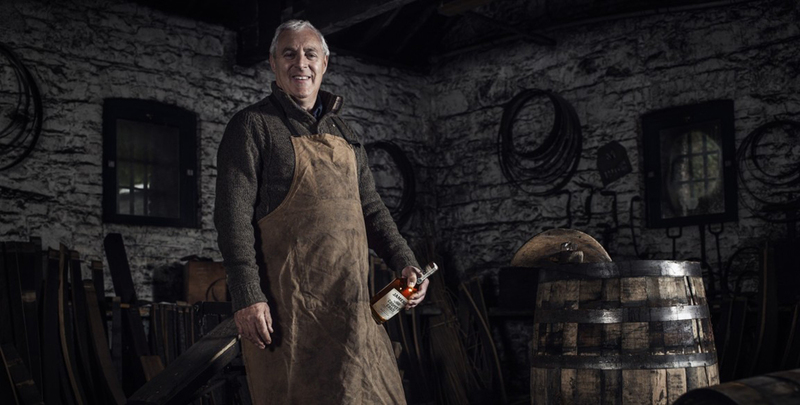 He’s a fifth generation cooper, with the craft being passed down in his family for more than 200 years, and after a life spent in the industry he’s still passionately keeping the art and skill of coopering alive. Buckley has in many ways become one of the faces of Jameson and Irish Distillers, as well as one of the few true stewards of this oft-overlooked but absolutely vital aspect of the whiskey industry. Not only has technology not been able to replace coopering, but the craft is still performed with the very same ancient tools it’s always been. 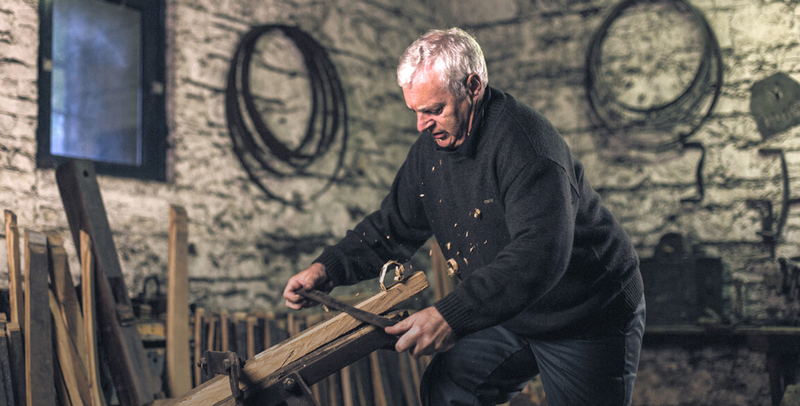 It’s been a huge privilege to work in a craft that has been in the family for over 200 years; to work exactly in the same manner as previous generations using the very tools that they used. There’s the “dog”, used to pull off staves; the “swift”, here named for a bird native to Ireland but known by assorted other names elsewhere in the whiskey world; hollowing knives and backing knives; cooper’s axes, hammers and drivers; the compass used to measure the circumference of a barrel. One’s tools are passed down and guarded as closely as his knowledge of the trade–the compass Buckley wields was made by his great uncle. That most recent hire is the apprentice whom Buckley is now instructing. “It is very exciting to have an apprentice and to have the opportunity to pass on my knowledge and skill to the next generation to keep an unbroken line of coopering in Ireland stretching back over 1,000 years,” he says. So the apprentice toils away under Buckley’s watch. He’s not the only one gaining an appreciation for coopering from that master craftsman behind this vanishing trade, though. The same can be said for any visitor who has a chance to listen to Buckley’s stories, and to soak up his passion for and knowledge of the industry, working up a thirst while learning a thing or two which will make that next sip all the more rewarding. For Buckley’s sake, make it something Irish. Want to dig deeper into Irish whiskeys?